Merry Christmas to all & to all some good Deals! I am so serious, you aren’t even ready for the amount of goodies we have for you. We dropped prices, added a coupon to get 20% off your order of $100+, and there’s free shipping on orders $60+! That’s a lot to take in so let’s break it down again. Get an early start on your holiday shopping and stock up on decor and gifts! We lowered a ton of prices on some of our best sellers! Get them while they last! Also, if you’re subscribed to the blog email list, you have been able to shop this sale for about a week already! You really should subscribe because you will get bits of insider info, and other fun things! Join us! FIVE pages of sale items!!!! So your next gift is 20% off when you spend $100 and more. That’s awesome and totally easy to do! You can combine this with the Christmas in July sale items! You will need to use the coupon code FH81TKY, and be signed into your KP Creek account. This coupon can be used on anything on the site. My personal favorite has been our Farm Fresh Decor items. We have been getting a lot of great farmhouse items. And you can’t forget about our New & Trending category; you should always be checking that out! And finally, spend $60+ and get FREE SHIPPING!! I LOVE when I can get free shipping. It is such a motivator to treat myself a bit! 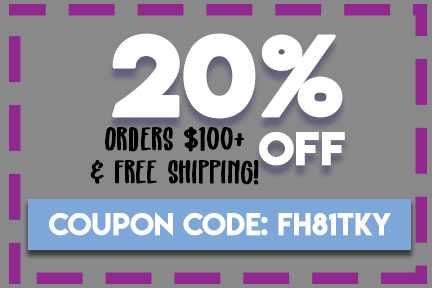 Even if you have your eye on using the 20% off coupon, you will still be able to qualify for free shipping, because you will still meet the minimum! So GET SHOPPING!! Shop the easy way so you can stay cool and refreshed! Online shopping is what it is all about! No need to even change out of your pjs! You have all of July to take full advantage of these gifts. The way this year is going, July will be over before we know it. So DON’T MISS OUT! So tell me, besides this sale, what are you most excited about this summer?